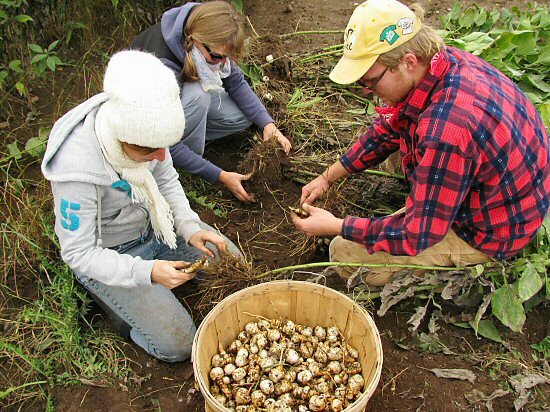 For tomorrow’s farmers’ market, Lynn, Andie and Jordan harvested more of this year’s Jerusalem artichoke. The tubers have gotten noticeably bigger since pulling some just a couple of weeks ago… Chokes are a really simple, satisfying harvest, at least, when you pull up the plants in their first year. These guys are spaced at 12″ (30cm), so we just grab the usually multiple stems at each spot and tug. The main root ball is shallow and contains most of the tubers: pull ’em off, and bang the root clump a bit to get at the ones in the middle. You also have to scrabble around for maybe a hand’s width or two past the little root crater to find a few extra outlying tubers—guess that’s where the “invasive” part of choke lore begins, they do try to spread. Overall, though, it’s quick and easy, especially when the fall weather is mild like today. Nice! I’d love to try these sometime, maybe when I have a bit more garden space. I’m growing these next year and am curious to know if you suggest leaving the bits in for a perpetual crop or do you start from scratch with new tubers every year ? miss m: I suggest digging them up completely each year, and replanting again as early as you can in spring. I do this because I move the beds every year. I started because I’d read that they the roots (tubers) get increasingly gnarly as they grow from year to year, and also, the plants can become invasive. What I’ve found is that, even in our short Ontario growing season, chokes grow really well in one season from scratch, and it’s useful to move them around the field, as a windbreak, or just for…fun. But, experiment. They’re easy. Hope that helps! I have three plants going right now. All the leaves are green, and the flowers are slowly losing their yellow petals. How did you know that the plants were ready to harvest? Did you wait until the plants were obviously dead? Matt: After frost is usually a good time, but you don’t have to wait for a particular plant stage, you can dig some up whenever, even a lot earlier in the season. But in late fall, after frost and when the plants have more or less died off, size and taste are better. You can also leave the tubers in the ground all winter as well, so if your soil doesn’t freeze solid, or you mulch the plants, you can harvest whenever you need them. I hope i can be happy as you all are some day, some day i will have my one tiny farm, hopefully i Rendalen. This is the most beautiful please in the world. Please look it up on googleearth. My cabin is here and i hope to expand to a little farm and bring my family here some day. What do they taste like and what are they used for? I am not familar with them at all. I have some artichokes at one of my allotments in the uk (irst year) and I am looking to put some in at my other allotment would you say that this is the best time to move them ? I get the impression that the other allotment is more prone to frost ? would youput mulch (straw / hay) over them as well ? mmmmmMike! I just had Lynnard and Rae here, and we ate lots of tiny farm veggies… Thank you, they were delish. Next time, come with them and we’ll whip up something yummy for you too. Hey guys.. I really like you blog for that past few yeasr.. I really hope you get back to doing more frequent updates like you did in the past. It seemd the move to the new farm has changed everything?.. Mike, where are you? We miss you!